I downloaded the manual but it is so outdated it does not even have the country selection. Hi. According to an earlier post in this forum NCS use SimpleLPR 2.4 SDK which include South Africa. However, I have to forward this to @Admin since I do not have enough knowledge regarding this and what might be wrong. Thank you for the response. I am also rather curious on how & when a LPR configured camera triggers. With the other options it is easy to see when they trigger, however the LPR is not that clear. Once I know how/when it triggers it will be much easier to test as well. I really want to get his working. It triggers at fixed interval (in your case every 2 seconds) so it will capture a snapshot and send it to the library every 2 seconds and log it if there is a result. Ok. Seems bit strange that the event isn’t triggering then. I’ll play around a little more. Would it be possible (in a later version) to make the Plate number visible on the screen via the overlay? I think it would have been a great help in this situation. @Admin back from his holiday yet? I really need to get the LPR working, we really need to get this info. We are working on it but as requested by email if you could share a recorded video footage of about 10 minutes it would be very helpful for us to perform our tests. Thanks. Any update ? We have improved the LPR however it would have helped to get some samples from your scenarios. I am back in the office today. Will download the new version and report any issues. Couldn't replicate the problem. Try renaming the file C:\ProgramData\Moonware\Netcam Studio\Server\server.config and see if it also happens with clean settings or if something was wrong while upgrading settings from previous version. And let us know You’ll find other improvements like possibility to target multiple countries. 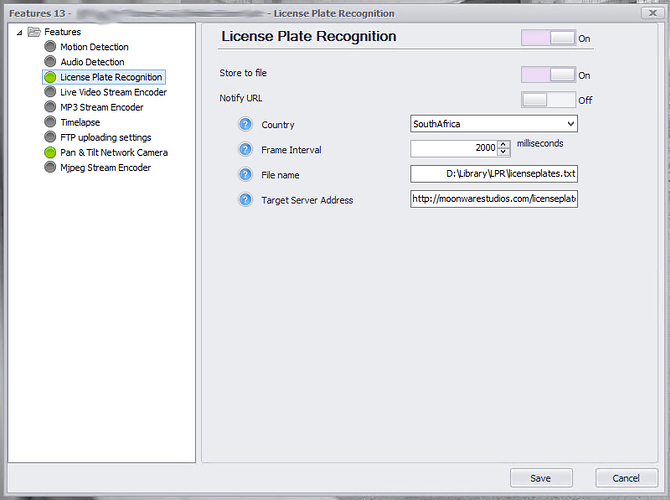 For testing, ensure that you use the overlay editor and display the $currentSource.lpr / lprCountry and lprConfidence variables over the stream. Ok got the server updated, now I can’t seem to add any cameras via the templates (works fine in 1.3.2). I was able to get the rtsp running and so far it seems to be going well. I would like to run the test for a few hours to get see how the record keeping is going. Please detail the problem for adding cameras using templates. I have verified and it seems ok here. 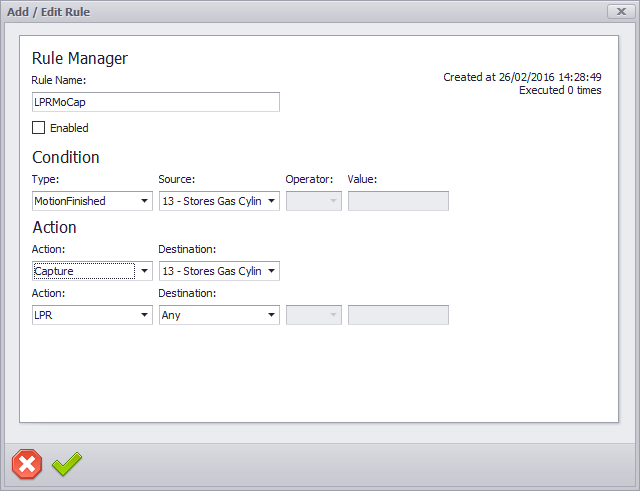 In the rule manager you can set a rule to do what you want on current.lpr change however using this approach there may be a delay. In the LPR plugin itself you can also chose to store the pictures. Well no it will just store text actually… but you can give a try to first option. It got a connection to the camera when I connected to the camera via the browser. Working fine now. I am just capturing an image on motion finished. much easier. So far the number plates have been pretty accurate so testing is going well. Thank you for the assistance thus far. Well you were very patient and I’m glad that it starts working for your scenarios. Anyway if you have opportunity to report what you do with Netcam Studio and how it works for you it’s very interesting. No, no, no. Thank you for assisting me so quickly since it would seem I am one of VERY few that seems to want to use this feature. I would, however still like the ability to trigger an LPR with an event instead of on a timer. 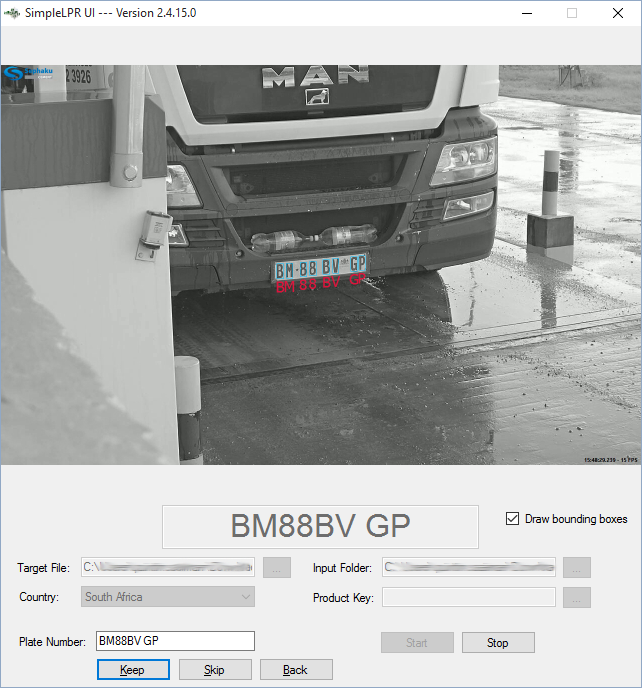 From the images/video sent you can see that a truck comes onto the weighbridge and once it stops that is when I want the LPR to happen. What is happening now is that the txt file is updated on the timer, so if the truck is on the bridge for 60 seconds I have ~30 entries and 30 images (if I trigger the capture on the LPR event). What I did now was put a OnMotionFinished to capture the image so I only have 2 images (one of the truck and one of an empty bridge) so that is manageable. So you can see why I would want the option to trigger LPR on a OnMotionFinished event. Something else that would also be helpful would be the option of a delimiter in the text. Right now the plate and the time are not separated. So adding a comma, or allowing me to choose a delimiter would be very useful. And last but not least. If I do trigger a LPR with an event (like OnMotionFinished) and I have the option to select a 2nd Action (see image), to capture a image for example, to also add the image name to the file. This is to make finding the image that goes with the plate much easier. Triggering the LPR from outside the plugin itself is pretty delicate so I doubt that we will implement anything like this in a near future. Delimiter in the file is pretty easy and I will do it asap. As for multiple actions on the same rule, it’s possible but just requires mutliple rules with the same condition to be created. Thanks for the reply. The delimiter is the most wanted item in the post. The other items are all QoL items, so if you can get them in it would be great. Hi everyone, I’m new here but would just like to say that I am also interested in the LPR feature. And I like how simple and easy the NCS system is. I’ve been playing around with iSpy for a while now which is OK, but a bit tricky to figure out and not as neat and clean as NCS.